... The authors finish by offering up an interesting possible formation mechanism. This black hole is far too massive to have been generated upon the death of a massive star, but it may have formed from stellar mergers. If that’s the case, then it should take an entire dwarf galaxy to produce a black hole so massive. 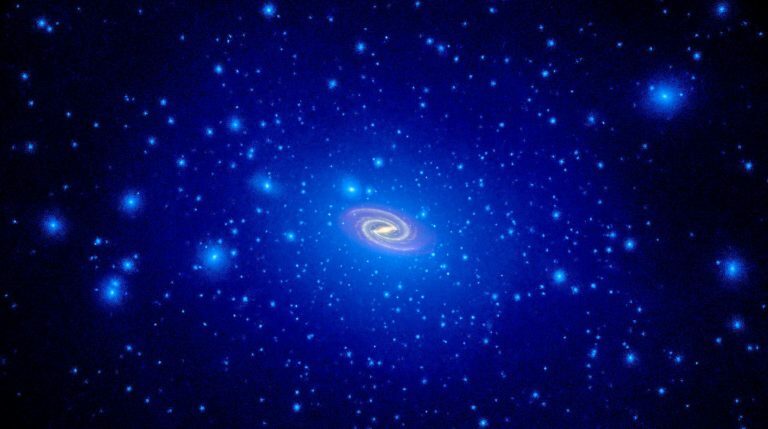 Given the dozens of dwarf galaxies drifting around the Milky Way in various stages of cannibalization, the authors suggest that we may be seeing the black hole remnant of a long-lost dwarf galaxy. This means that IMBHs could represent signatures of the Milky Way’s galactic merger history which has already been erased in the kinematics of stars, and further discoveries could also indicate the likelihood that Sgr A* is itself the product of stellar mergers. Can gas giant planets form through pebble accretion? Do you know how gas giant planets form in a protoplanetary disk? It all starts with a bunch of planetesimals (km-sized and above) that collide together one-by-one until they grow into an object that is the largest in the neighborhood. As the biggest object in its vicinity, this protoplanet core will naturally continue to collect and accrete more planetesimals until it consumes everything nearby. Eventually, the core will grow large enough to build up a significant atmosphere from the gas that makes up the disk. Once its atmosphere becomes more massive than the core itself, it will become unstable and devour a ton more gas — thereby growing to roughly Jupiter’s size. WFIRST is one of NASA’s key missions for the next decade. The mission is a 2.4m space telescope that will operate in the infrared, and include coronagraphic, spectroscopic, and wide field imaging functionalities, and will be launching in 2025 or 2026, for a 6-year nominal mission. That means the telescope should be functional for at least 6 years, and may well be extended if there is sufficient demand from the community. The key goals of the mission are to (a) answer fundamental questions about dark energy, (b) carry out a microlensing survey to assess exoplanet frequency across a wide stretch of parameter space and (c) directly image Earth-sized exoplanets around nearby stars. Today Prof Jocelyn Bell Burnell is known as one of the most influential scientists in the UK. But getting there was not easy. From girls not being taught science at her secondary school to being greeted to university by rooms full of howling men, her journey is one fraught with resistance. Her discovery of radio pulsars in 1967, as a young researcher at Cambridge, pays testament to her dogged pursuit of the truth and remains one of the most significant astronomical discoveries of the last 100 years. Here she discusses her incredible career, as well as her thoughts on the future of science and its place in society in conversation with Andrew Cohen, Head of Science at the BBC. "In those rare moments of total quiet with a dark sky, I again feel the awe that struck me as a child. The feeling is utterly overwhelming as my mind races out across the stars. I feel peaceful and serene." Every galaxy has a story to tell. And every story has a few common plot devices: violent supernovae from dying young stars, bursts of activity from central supermassive black holes, mergers with other galaxies, and other dramatic astrophysical events that can change the course of a galaxies evolution. One galaxy property in particular can be severely impacted by these events, and that’s how many stars it is forming at a given time. The Star Formation Rate (SFR) throughout the lifetime of a galaxy is known as its Star Formation History (SFH), and is of interest to physicists trying to understand the lives of all galaxies. Unfortunately, we can only see the stars that are in the galaxy at any given time; to infer the past history of star formation we must look for evidence of previous star forming events. For nearby galaxies, we can see them in enough detail to see separate populations of stars, and determine their individual ages. But for galaxies further away we can only observe the combined light of all the stars mixed together, and then have to disentangle each component in order to get the underlying history of star formation. We can all acknowledge that stars are some of the coolest objects (figuratively speaking) in the Milky Way galaxy. But today we consider something even cooler (literally speaking): the envelopes of certain stars. Is S0-2 a Binary Star? The most exciting discoveries in astronomy all have something in common: They let us marvel at the fact that nature obeys laws of physics. The discovery of S0-2 is one of them. S0-2 (also known as S2) is a fast-moving star that has been observed to follow a full elliptical, 16-year orbit around the Milky Way’s central supermassive black hole, precisely according to Kepler’s laws of planetary motion. Serving as a test particle probe of the gravitational potential, S0-2 provides some of the best constraints on the black hole’s mass and distance yet, being the brightest of the S-stars, which are a group of young main-sequence stars concentrated within the inner 1” (0.13 ly) of the nuclear star cluster. As our readers likely know, the LIGO Scientific Collaboration made history in September 2015 with the first direct detection of gravitational waves. Since the historic initial detection, there have been several more measurements of binary black hole (BBH) mergers (including one announced yesterday!). Today’s astrobite explores a strange question arising from the initial LIGO results: why were the BBH sources much less massive than LIGO’s sensitivity suggests they could be? Though four detections aren’t necessarily representative of an entire BBH population, it turns out that some statistically significant information can still be gleaned from just a few sources. Only a short while ago, in September 2015, the Laser Interferometer Gravitational-Wave Observatory (LIGO) made its maiden detection of the ripples travelling in spacetime, known as gravitational waves. The detection of these waves, a key prediction made by the Einstein’s Theory of General Relativity, has since revolutionalised the field of astronomy by presenting a novel avenue for us to understand the workings of the ever-so-elusive-and-vast cosmos. In the discovery that LIGO made, it sensed the gravitational waves created by the merger of two distant black holes, each about as massive as 30 Suns. For scientists specializing in black hole physics, as well as others with a keen excitement about the field, this event immediately triggered the question: how many more events will we see, and how often? Venus’ thick atmosphere is full of surprises. Our nearest planetary neighbor (between 0.28 and 1.72 astronomical units away, depending on the time of year), Venus has been visited by over a dozen spacecraft. The fleet of past and present Venusian spacecraft have revealed sulfuric acid clouds, a surprising lack of a global magnetic field, and a young surface studded with sprawling mountains but devoid of any Earthly plate tectonics. Chief among the oddities discovered at Venus is its ferociously fast atmosphere; though Venus rotates sluggishly, just once per 243 Earth days, its atmosphere whips around much more quickly—the speediest layer, at an altitude of about 70 km, takes only a few days to circle the planet. This phenomenon is called superrotation. Although Venus’ atmospheric superrotation was discovered in the 1960s, the cause is still debated. What, then, makes Venus’ atmosphere go ‘round? The newest of the Venusian spacecraft, Japan’s Akatsuki orbiter, is equipped to study the atmosphere of Venus and may help to answer this question. Slated to arrive at Venus in 2010, Akatsuki initially missed its target and spent a few years orbiting the Sun before achieving orbital insertion at Venus in 2015. In its brief time at Venus, Akatsuki has observed the dynamics of Venus’ atmosphere, including a planet-wide gravity wave (not to be confused with a gravitational wave!) shortly after arrival. Last edited by bystander on Sun Dec 17, 2017 5:16 pm, edited 1 time in total. In discussions of exoplanet atmospheres, variations of the word “illusion” come up a lot. They pop up 27 times in today’s sobering article, which takes stock of the current state of knowledge and observational techniques. The fact is, real science is much messier than the popular image of science as a streamlined and systematic process of establishing truths. Despite scientists’ best efforts, published results sometimes turn out to be illusions. This is indeed incredibly interesting. I note that an overall tendency of both the CMB and the galaxy estimates is that the Hubble constant has been decreasing somewhat, though a lot more in the CMB measurements than in the galaxy estimates. Could a non-constant dark energy "constant" explain the disagreements? Or is it possible that the more we learn about the Universe, the lesser the need for a mysterious dark energy contributor becomes? Or is that, too, wishful thinking?